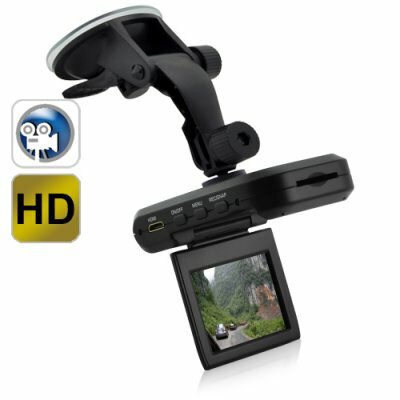 Successfully Added HD Mini DVR with Viewscreen for Car Sports and Life Blogging to your Shopping Cart. Record everything in your life, but do it in 720p definition with our new stylish HD Mini DVR with flip-down Viewscreen. This new digital camcorder type gadget can be used for multiple video recording situations from the car, to the beach, and even the boardroom. With 720p high definition video quality, HDMI output, and support for SD cards of up to 64GB (SDHC), you can use this baby any time you need as an easy to mount digital video camera for on-the-spot video capture. This Mini HD DVR can effortlessly shoot high clarity videos of True 720p HD quality videos at touch of one button. It comes with a 2.5 inch LCD screen that can be used for setting up and watching live as you do your point and shoot recording. It even comes with a picture camera mode if you decide to take high quality pictures instead. You can skate a rail, back flip on your bike? Why not record your best tricks in high definition so you can study for yourself or enjoy with your friends later on. The suction mount and its built-in mic making it ultra convenient for recording video and audios from interview, conversation, group meetings and work demonstrations. Place it on your front windscreen or on top of the dashboard to accurately documenting evidence of wrongful driving and personal injury if someone runs into you, property damage if someone vandalizes your car. Its slim design, strong suction mount and motion detection recording ability makes it another great choice for multi-purpose covert surveillance or undercover video recording. Youtube Video Directors: Have you noticed more and more Youtube videos are now in HD quality? Catch the trend and upgrade your videos to 720p high definition. Amaze your Youtube fans, show off your skills in front of potential sponsors, making a video blog or even open your own reviewing channel. Whatever you are planning to do, our HD Mini DVR will help you do it better! Our unbeatable wholesale price will make sure you can take full advantage of this high definition, high quality, multi-purpose DVR without breaking your wallet. Simply click "Add to Cart" right and join the quest for better and higher definition video. Available with our 12 month satisfaction guarantee, only from the leader of China electronics wholesaler - Chinavasion. Does HD Mini DVR record sound too? This HD action sports camera does indeed have a built-in microphone. Can I use this HD Mini DVR without the car charger? Yes, just make sure to charge the battery full. I purchased 2, both for my car, and this is an EXCELLENT product. Despite the 2.5 view size, the view quality is outstanding..better than real life The HD picture quality will blow you away when you view your video on your computer of TV. Matters not what the weather is doing outside...fog, rain, overcast or sunny, the video quality is beyond belief. I am glad to see the suction mount has been redesigned, since the previous mounting design is prone to breaking. Since I use these primarily in the car, the extreme temperatures inside the car concerned me, however, they are like a timex...takes a lickin and keeps on ticking. This is an excellent buy. I would suggest that the suction mount be available for separate purchase since earlier models tend to break, as mine have.